I looked for it; honest, I did. But I didn’t see any notice of the event. 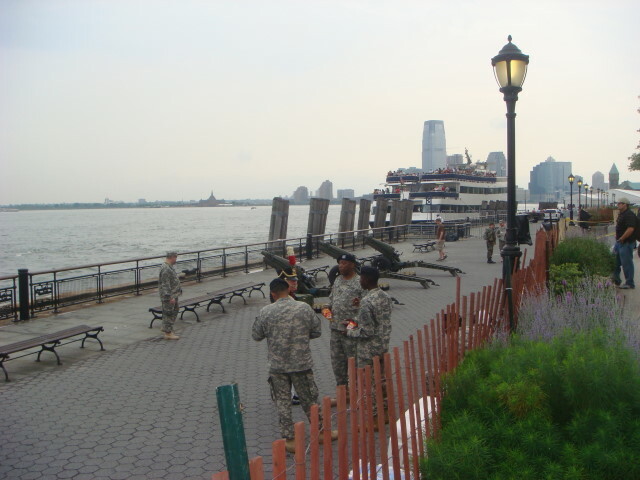 Last year, I had wandered down to Battery Park on the 4th of July and found a group of guys in olde style military outfits and some guys from the National Guard just firing off some howitzers. 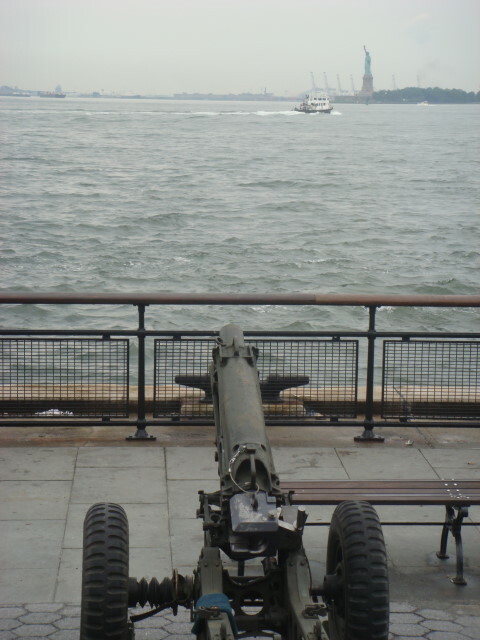 There was a purpose to it, even in NYC we don’t fire howitzers without reason. This was a ceremony in which each State is called out in the order it joined the Union and a howitzer is fired in its honor. Loud. Oh yeah; fireworks have nothing on a howitzer from 10 feet away. Despite no notice, I found them where I expected ’em. 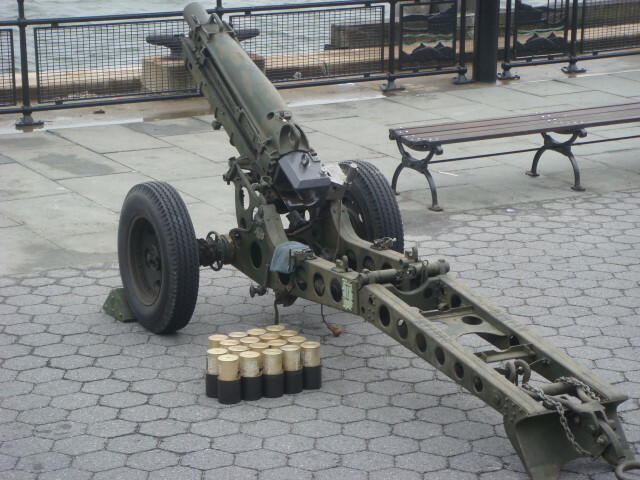 You couldn’t get right up to the artillery, but that’s okay. There were three guns and each had some blank ammo next to it. Yeah, blank. Otherwise, look at the direction they were aiming. We ain’t shooting Lady Liberty here. It turned out that they weren’t going to start until noon. Noon! It was only 10am when I was there. I had other things to do than plug my ears with my fingers. But it is a good show. Next year I plan to get there in a timely manner. This entry was posted on July 5, 2008 at 5:16 pm and is filed under Events, Manhattan. You can subscribe via RSS 2.0 feed to this post's comments. You can comment below, or link to this permanent URL from your own site. your instructions for shnpaig the kishes were fantastic, and actually I have something to confess My Grandma gave me here recipe for knish when I was 14, now I am 28, she explained to me how to shape them (grandma type explanation) and I never tried it when she was alive ( and never really understood how to shape them). Have always been scared to do potato knish as I didnt know how to shape them until now. Thanks to your pictures now I understand what grandma explained me years ago. You made my heart smile with this.Thank you very much! I send to you a very big hug. Hi Joe,I made this last night. Thank you very much for the recipe! The dough comes out great, crispy and flaky. And easy to work with. By the way, your web site is amazing! Got a lots of tutorial and clear instruction. I found your site on smittenkitchen while searching for potato knish. Will definitely bookmark and come back for another recipes. Thank you! Now, take a look at the typical auto insurance declarations page shown opposite. If Quotes Chimp do purchase med pay, the decla�rations page will tell you how much you are selecting. Did you know that the limit of coverage is not necessarily the maximum your company could have to pay? That’s because, unlike liability coverage, the med pay policy limits do not refer to the total coverage available, but rather to the total that can be collected by each covered injured individual. Thus, if three people are seriously injured in an accident where the owner/driver of the car had $2,000 in med pay coverage, the insurance company could be on the hook for $6,000 under the med pay clause.